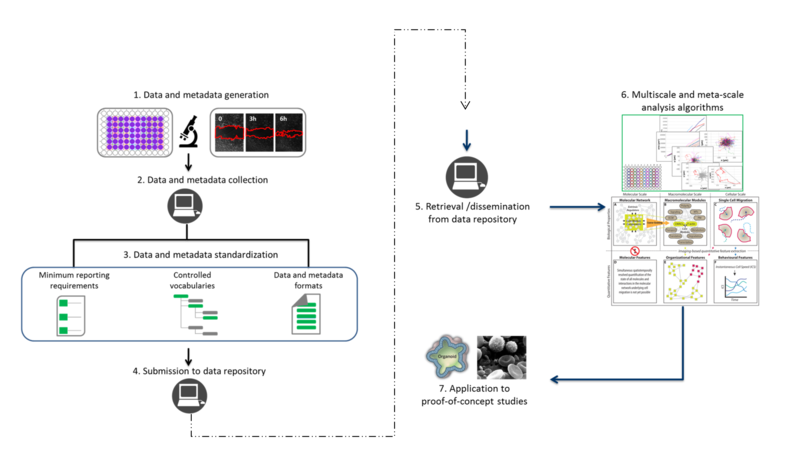 MULTIMOT is a H2020 EU funded project that aims to build an open data ecosystem for cell migration research, through standardization, dissemination and meta-analysis efforts. Cell migration is a fundamental process in medically highly relevant topics, including morphogenesis, immune function, wound healing, and cancer metastasis, and the study of cell migration thus has a direct impact on major clinical applications, especially regarding personalized treatment and diagnosis. Over the last few years, cell migration research has benefited enormously from advances in methodology and instrumentation, allowing multiplexing and multi-parameter post-processing of cell migration analyses to become widely used. As cell migration studies have thus de facto become both a high-content as well as a high-throughput science, an urgent yet largely unmet bioinformatics need has emerged in the form of intra- and inter-lab data management solutions, standardization and dissemination infrastructure, and novel approaches and algorithms for meta-analysis. The central goal of MULTIMOT is therefore to construct a comprehensive, open and free data exchange ecosystem for cell migration data, based on the development of extensible community standards and a robust, future-proof repository that collects, annotates and disseminates these data in the standardized formats. The standards and repository will be supported by freely available and open source tools for data management, submission, extraction and analysis. Importantly, we will also demonstrate the application of large-scale integrative data analysis from cell migration studies through two proof-of-concept studies: guiding personalized cancer treatment from patient organoids, and providing patient-specific diagnosis based on peripheral blood leukocyte motility. The following figure shows an overview of MULTIMOT. Data and metadata associated with cell migration experiments are generated (1). Software is used to analyze and interpret the resulting data and associated metadata (2). The collected data will be formatted and reported in the relevant standards to enable data and metadata reproduction, verification, and exchange: minimum reporting requirements will specify the core information to be supplied through the software tool; controlled vocabularies (CVs) will be used to unambiguously annotate such units of information; and the data will be exported using data and metadata standard formats. Fully standards compliant cell migration data sets will then be submitted to (4), and subsequently disseminated from (5), a global data repository, which will constitute the centerpiece of the open data sharing ecosystem. This will in turn enable the reuse of public cell migration data (6), including multiscale and meta-scale analyses across large scale experiments, ultimately unlocking new knowledge in the field through proof-of-concept-studies (7). Further information can be found in Masuzzo et al., 2015.